Academic and administrative activities were grounded yesterday at the University of Ibadan (UI) as non-teaching workers of the institution protested alleged disparity in Federal Government’s disbursed earned allowances/earned academic allowances. Also, leaders of Academic Staff Union of Universities (ASUU) leaders have said their lives were no longer save on campus. They said they had been receiving threat messages from members of sister union, the Non-Academic Staff Union of Universities and Allied Institutions (NASU). All the gates into the university were shut except one. The Federal Government had disbursed N18.3 billion for earned academic allowances of 22 universities to cover 2009/2010 while N4.6 billion was allocated to non-teaching workers in 24 universities. Out of the amounts, UI academic workers reportedly got N1.6 billion for earned academic allowances while non-teaching workers were allocated N105 million. It was gathered that this generated tension on campuses with ASUU Chairman at UI, Dr Deji Omole, alleging threats to his life and that of the union’s secretary, Dr Peter Olapegba. As early as 7:30 a.m yesterday, the four gates to the institution had been put under lock and key while persons having businesses to transact on campus were forced to trek long distances into the school. Traffic stretched from the university’s front gate to Orogun; many motorists abandoned their vehicles by the road sides and trekked to their destinations. Lecturers abandoned lecture halls following news of threat to attack them by non-teaching workers. 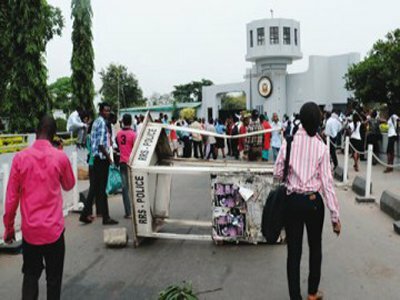 It was gathered that the Vice Chancellor, Prof Idowu Olayinka, had called a meeting of union executives on the payment of the allowances on Monday evening where he intimated them of the letter he received from the Federal Government with the stipulated amount for academic workers and the other for non-teaching workers. The vice chancellor was said to have pledged to follow Federal Government’s directive. At the Monday meeting were ASUU representatives, led by its Chairman, Dr Deji Omole; NASU, led by its Chairman, Segun Arojo; the Senior Staff Assocaition of Nigerian Universities (SSANU), led by Wale Akinremi; the three deputy vice chancellors and the Bursar, Mr Michael Alatise. Prof Olayinka was said to have read the letter from the Federal Government (through the ministries of Finance and Education) on the received funds for the payment of Earned Academic Allowances/Earned Allowances. The vice chancellor added that he was going to pay as directed by the Federal Government. On behalf of the non-teaching unions, Chairman SSANU Wale Akinremi said the unions had received a directive not to be part of any sharing committee on earned allowances. He said the unions were aware that the problem was not from UI but from Abuja. A letter by the Director of Funds in the Accountant-General’s Office (Alexander M. Adeyemi) from the Federal Ministry of Finance to UI vice chancellor, titled Re: ASUU Strike and the Request to Release Earned Academic Allowance, said N1,626,117,386.20 had been paid into the Treasury Single Account (TSA) account of UI for academic worker while N105,709,758.33 was paid to non-teaching workers. As at the time of filing this report, non-teaching workers still occupied the Nigeria Institute of Social and Education Research (NISER) Pack of the institution while only one of the three gates was partially opened at 12:30 p.m.
No sane Nigerian will blame the unions for their latest action.The government is culpable in this academic homicide.